To enjoy a strong, healthy smile for life, it is important to start good oral hygiene practices early. 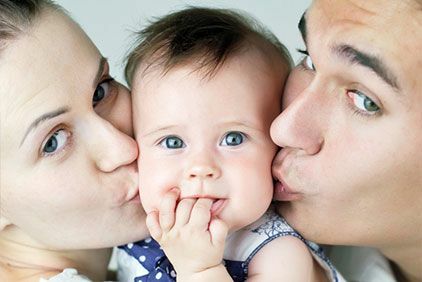 Many new parents wonder when it is time to introduce their baby to oral health care. Most babies get their first teeth between the age of six months and one year. Even before these teeth erupt, the mouth should be cleaned on a regular basis. In addition, a first dental appointment should be scheduled before the child’s first birthday. At Signature Smiles, we provide pediatric dentistry services that preserve a child’s oral health and create a positive relationship with the dentist. By encouraging a good oral hygiene routine early on, parents can ensure their child benefits from a healthy smile for life. We also advise patients on the best way to clean baby teeth. Our Woodinville, WA dental staff is happy to provide some easy tips for the best way to clean baby teeth and promote a lifetime of good oral hygiene habits. Taking care of baby teeth is different from taking care of your own teeth so most patients aren’t sure where to start when it comes to their child’s oral health. Start right away: As soon as your child is home from the hospital, they are ready to have their mouths regularly cleaned. Even though they won’t have teeth yet, bacteria can build up on the gums. To keep the gums and mouth clean, gently wipe the top and bottom gum line with a damp washcloth. By starting this routine right away, parents can get their babies accustomed to this process, which will make brushing easier when the time comes. Brush teeth daily: Once a baby’s teeth erupt, it is time to start brushing them. This should be done with a soft, rubber finger brush. Prepare for brushing by getting a damp washcloth, the finger brush, and a tube of fluoride-free training toothpaste. Apply a pea-sized drop of toothpaste to the brush and cradle your baby in your lap as if he or she is going to be fed. The finger brush should be gently rubbed on the gums, and the front and back surfaces of the teeth. When brushing is complete, the washcloth should be run along the gum line and then brushed over the teeth to “rinse” them. Keep your baby distracted: Even if brushing is a regular habit, your baby may fuss or wiggle when it is time for his or her mouth to be cleaned. If this is a struggle, parents should try distracting the baby by providing toys that will keep the hands and mind occupied. Progressing to a toothbrush: Once a baby has gotten the back molars, which typically occurs around 12 to 18 months, it is time to progress to a toothbrush. Parents should choose a soft-bristled toddler toothbrush. Apply a small amount of trainer toothpaste and use a circular motion to clean the front and back of the teeth, and then the biting surface of the teeth. The tongue, roof of the mouth, and cheeks should also be gently cleaned. After cleaning the teeth, a damp washcloth should be used to rinse the teeth and mouth. At Signature Smiles, we provide a wide range of dental services to meet the needs of your entire family. If you have questions about our pediatric services, or are ready to bring your baby in for the first dental exam, schedule an appointment at your earliest convenience.